All of the following restaurants are fairly inexpensive (no more then $5 per person). 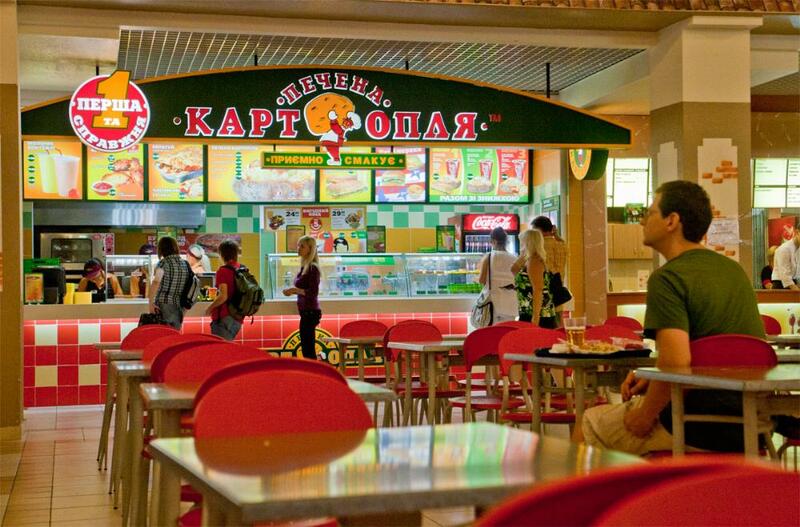 Almost every shopping mall has a food court with 5 to 10 mini restaurants. As a rule, you can see all food right before your eyes, so it's not difficult to make a choice. Here in Ukraine fresh bakery and sandwiches are not as popular as in West European countries. At the moment the only available sandwich bar is Mr. Snack (12). Besides, it's not that easy to grab a snack at the train and bus stations. If you are new to Ukraine, then try to eat at the restaurants described below or try restaurants that are more expensive. In many medium-sized and small towns very often you can eat only in old Soviet style cafes. We eat in such places very rarely, but sometimes even Soviet style cafes can offer you some tasty food. Chain restaurants with local fast food cuisine, often designed with a national tint. Dish names are translated into English. 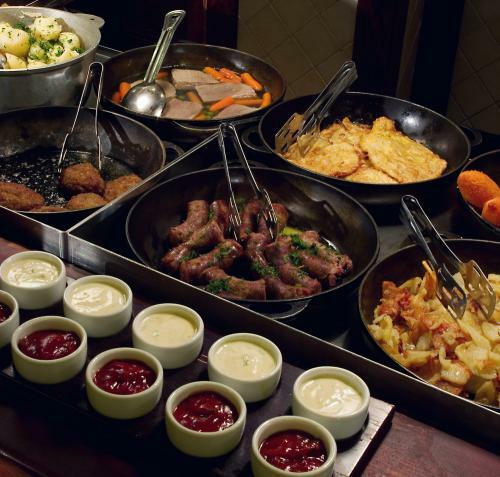 We recommend: Chicken Kiev (a chicken cutlet in breadcrumbs with melted butter inside), Solianka (Hodgepodge - a soup with several kinds of meat, black olives and lemon), Borshch (beet soup), pancakes, varenyky (large stuffed dumplings with different fillings), uzvar (national compote - stewed fruit drink). Quantity: 174 (2012), network map (in Russian). The largest restaurant chain in Ukraine mostly with Italian cuisine. 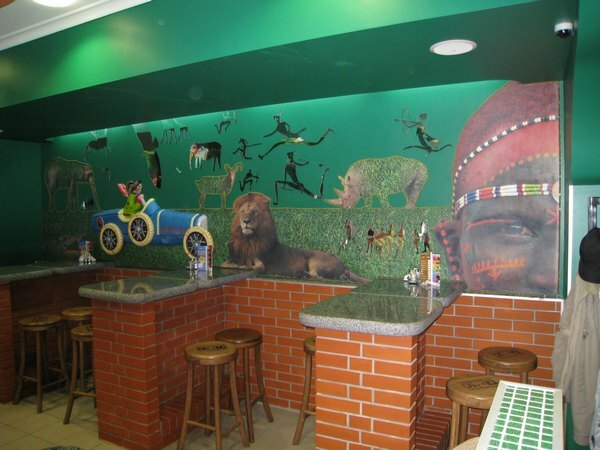 All restaurants have the same design, but different pictures and small items on the walls. In case of an order that exceeds 200 Ukrainian hryvnyas ($25) you'll receive a cumulative discount card. The discount will start at 3%, then, if you accumulate a specific amount of bonuses, it will reach 5%, and, finally, 10%. This card is valid in all restaurants of the "EgoJisty" network. Besides Celentano, the network also hosts the Potato House restaurant (7). We recommend: potato al forno, pasta, pancakes and of course pizza. Alternative fast food restaurant. The main dish is baked potato with various fillings plus sandwiches and desserts. We recommend: Baked potato, cherry pie. Exact copy of Pechena Kartoplya (4). For a long time we even didn't notice the difference, thinking that it was the same chain. Quantity: 8 in Kyiv (2012), map in Kyiv. Chain restaurants with local fast food cuisine similar to Puzata Hata (1). From time to time this restaurant features weeks devoted to cuisine of different countries, such as Polish, Czech, Scandinavian and even Italian. Chain of fast food restaurants focused mostly on Mexican cuisine. Belongs to the "EgoJisty" network, which also hosts the Celentano Pizza. Positions itself as a large fast food network, but the assortment and quality are significantly better in other fast foods. The only decent dish is varenyky. Probably the cheapest fast food network. The assortment is an almost exact copy of the McDonalds. We never visited it and are not going to visit in the nearest future. Chain restaurants, local fast food cuisine. Fast food restaurant without reference to any specific cuisine. The only chain sandwich bar in Ukraine as of 2012.